The Ecclasian Teaching program is one of the most respected not only in our local community, but also in the Craft community as a whole. We have been teaching our structured curriculum for almost twenty years and are continually updating and improving our classes. Ecclasia is a lineaged group, and as such offers community accepted training through the degree system. Our training begins with the most basic, informational Wicca classes and extends to and beyond initiation into the Elderhood of third degree. We are often asked for advice about what would be the best choice for learning. We offer the article, "Choosing a Teacher" to answer some of the most common questions. We are sorry, but Ecclasia does not offer correspondence or on-line training at this time. Our beginning Wicca class lasts between eight and ten weeks depending on the class and teacher. It is often called "Wicca 101" in other traditions. It is presented in an informational style with no pressure to go beyond the class into more advanced work. As such it is a good starting point for someone wanting to learn more about the Craft, but unsure of how involved they wish to become. Also it is a good place for family and friends to learn ours is not a threatening religion or way of life. The current fee for the beginning class is $20.00 for the entire class (not per class). Individuals desiring to attend the advanced class with prior experience may challenge the beginning class. Week One: History, philosophy, and main beliefs. Week Nine: In class circle, review of class and preview of advanced class. Our advanced class lasts a minimum of a year and a day, or 53 weeks. Classes meet once a week for two hours. It is an in-depth study of the basics covered in the beginning class. The class has a strong focus on the ethics of the Craft and on competent circle presentation. Students learn through a combination of hands-on exercises, in class discussion, and home study. Upon completion of the class students may initiate into our tradition if desired, although course work is not the only prerequisite for initiation. Current fees for the advanced class is $20.00 per month (four meetings). The Threshold Materials. The Threshold materials act as a bridge between the beginning class and the advanced. The cover the ethical and philosophical aspects of the Craft of the Wise. The Chronicles of the Path. The Chronicles are our traditions foundational documents. They contain our rights and responsibilities and well as the structure of group operation. Section One: The Religion of Wicca. 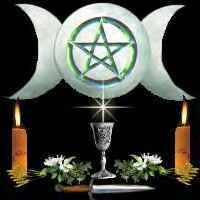 This section covers the aspects that define Wicca as a religion, rather than simply a ritualistic practice or magickal art. Section Two: The Sacred Circle. Everything you ever wanted to know about circles and ritual. Section Three: Transforming the Self. In this section we deal with issues of the innerself. From issues of mental health and well being to dreaming and meditation. Section Four: Health and Healing. Health and healing are discussed in this section. From Reki and Polarity therapy to energy work and herbs we look into the varied aspects of alternative health. Section Five: The Magickal Life. Magick and spell work with a heavy emphasis on ethics and protection. Section Six: The Sixth Sense. In depth, hands on study of divination. An advanced tarot class is also presented in this section. In addition to the above outline we strive to bring in several experts from various aspects and traditions of the Craft each year to teach classes in their fields of expertise. The second-degree program focuses on the inner path. Through meditations, personal energy working, and self-reflection the initiate learns how he or she fits into the Wiccan community. Leadership and responsibility are the keywords for the second-degree path. The third degree program is individualized and more information can be given to appropriate candidates. The healer's path is an advanced; hands on teaching environment for those called to this art. The diviner's path is an advanced; hands on teaching environment for those called to this art. The teacher's path is an apprenticeship under a corded Ecclasian teacher, which leads to teaching privileges within our tradition.